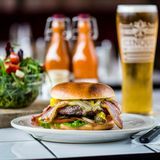 Did you know you can now order your Deliveroo takeaway from OAKS here on View? 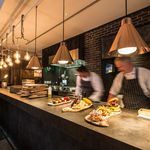 OAKS Nottingham is a stylish restaurant serving a range of locally sourced sausages and meats cooked over wood embers. OAKS also offers a small cocktail list, craft beers and wine by the carafe. 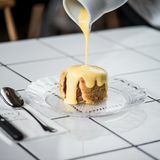 "OAKS is a unique concept in central Nottingham serving simple, locally-sourced sausages and meats cooked over wood embers. The logs for the custom-built grill are the natural by-product of sustainable coppicing by the Nottinghamshire Wildlife Trust. OAKS works closely with local suppliers and celebrates Nottinghamshire heritage. OAKS serves a simple, pared down menu of core dishes made using local produce wherever possible. All food is cooked over wood embers with light, fresh and flavourful marinades and sauces produced in-house. 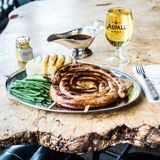 The focus in on quality and taste, with sausages produced by Tuxford’s family butcher in Netherfields to OAKS own secret recipe, sides and marinades made in-house, craft ales on tap from nearby Castle Rock brewery and a carefully selected range of well-made cocktails too. The skin-on, triple-cooked chips are a sure-fire hit. Join us on the weekend for live music from local bands and DJ’s, every Thursday, Friday and Saturday night. What did you think of OAKS?